Screams you never really loved me. Oh all practicalities aside, you may believe your neighbors are lucky to catch a glimpse of such a fine unclad form across the back alley, at least that’s what I told myself as I saved up for those curtains, but I suspect they would have preferred to be the one to make that decision. I’ve already judged myself – saving you the trouble. Cut me some slack it was the expense and indecision and not vanity that led me to throw modesty out the window. Let’s see if I can help you avoid my indiscretion, save you your dignity and in the process, deliver some ideas to assure you an adored home. If your eyes are the windows to your soul. Your windows may be revealing, literally and figuratively, more than you’d like….let’s create a bit of mystery. – I rent, not own, what if my next place has windows of a different size or style and my investment puddles at the floor? – What if I pick something that’s too opinionated and become tired of it just a few months later? – How do I know which style is right for the windows I have? These are valid concerns, so it comes as no surprise that we can feel paralyzed by the sheer number of choices, and start whispering to ourselves: ” I won’t think about it now….I’ll think about it later”. I am not a curtain expert. I know there are a lot of books out there to help guide me through the selection process, but I find myself losing interest quickly. I do however really love looking at magazines, and find them a valuable resource. Sometimes I lose sight of why I tore a page out to begin with, other times I am reminded immediately why I loved it so much. I search for different things in the photos – and am rewarded again and again when I find the perfect way to display those twin beds or a built-in that addresses my particular asymmetrical shelving situation, and yes of course – how other clever people have addressed or in this case – dressed their windows. – Assess the need: Functional or decorative? 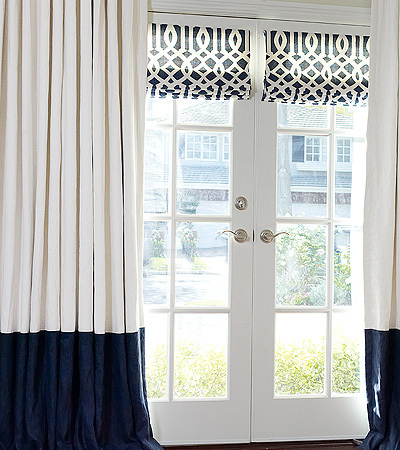 If it’s decorative you may be able to create a faux roman shade, which allows you to use less of that super expensive fabric you just had to have. – Functional: Windows are not always as beautiful as we would like them to be, but there is no reason we can make the best of which we are given to work. * Pelmets: a narrow wooden box, which you can construct yourself or pay a carpenter a nominal fee to construct on your behalf. This transformative little treatment is a must have in your tool box of beauty tricks – it’s does what Spanx does for so many of us – smooths out our lovable imperfections, turning us into models…of course. The beauty of this box is it obscures the header from view, and appropriately positioned it doesn’t block the light. It gives the illusion of height and who doesn’t want to look taller? Your windows are no exception. Add a simple curtain behind, for functional privacy and voila! You are a design genius. See it above – No. 2 shows what I was able to accomplish with my short, wide ugly duckling windows. 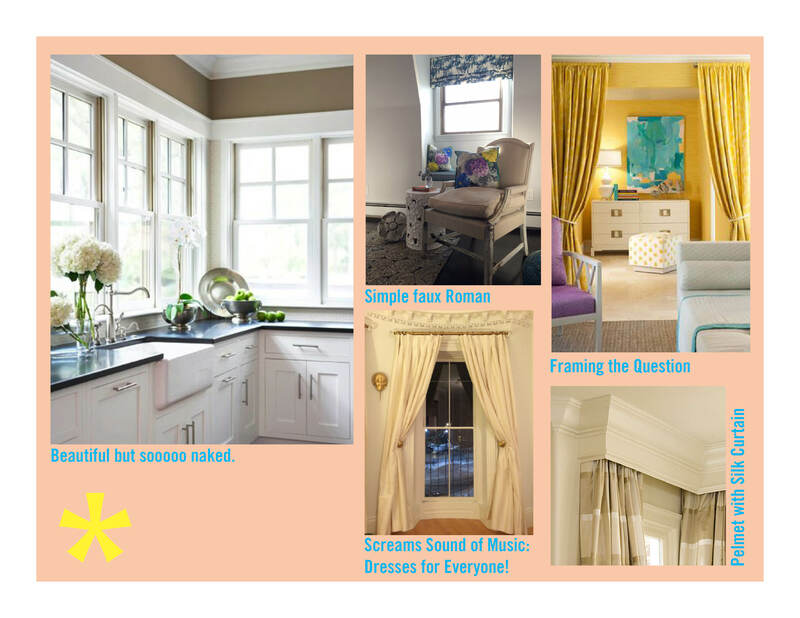 – Employ the Semi-Custom Approach: Since it’s not possible for those of us “Not to the Trade” to trot down to The Design Center to order and buy that Schumacher Fabric you saw in Domino Magazine, buying pre-fabricated curtains is not a bad option. If you want a really luxurious feel purchase four panels instead of two per window (believe it or not you will still save mazuma). Take them to a seamstress or even your dry cleaner. I have happily dropped mine off with a smile and a simple explanation – so much easier than sewing on a button, you can do! Indeed they can. Zimman’s Decorative Fabric and Home Decor www.zimmans.com 80 Market Street, Lynn, MA. Once you’ve found one that you love – consider using it as a border vertically or as a thick base at the bottom of a curtain that was store bought. You don’t need to be rich or overly adventurous to express yourself. It’s the dignified thing to do. « Resiliency . Resiliency … what a beautiful word.